I'm very excited for the Spiderman: Into the Spiderverse movie. I've appreciated comic-based animated movies in the past, but none of them have had the theatrical quality that this one seems to. 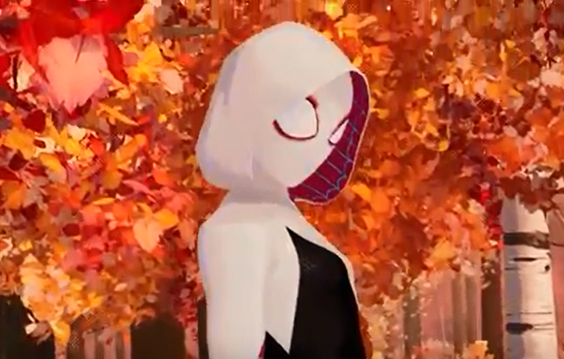 I know a character like Spider-Gwen is very unlikely to show up in a live action Spider-Man movie anytime soon, but I think both she and Peni Parker will have very influential roles in this one, and I chalk that up to the fact that it's animation. I could foresee future movies like A-Force, Generation X, or Alpha Flight in this style and I'm very hopeful that Spiderverse is successful and more projects get greenlit. I was very nervous about this figure since she looked so stiff and awkward in the solicit photos, but in person she is really fun, despite being essentially a "basic" figure. All the product showed up this past weekend at Walmart. I was impressed to also see a Peni Parker and SP//dr set that was previously unannounced (I didn't not buy it, but I posted pics on Instagram). Hopefully there is more product coming as well! Note how the packaging shows her shoes as white. I'm glad the final version has them in her iconic bright teal. This figure has odd articulation. She has hinge-and-swivel shoulders and elbows, a swivel neck, and a classic t-crotch. Having a Spider-character without knee, ankle, or wrist articulation seems like a waste. Also, her hood is loose and can be re-positioned slightly. Gwen comes with a cool web-slinging accessory that clips to her wrist. Despite it's bendy appearance, it is pretty rigid. Spider-Gwen makes a brief appearance in the trailer. She apparently is willing to reveal her secret identity within the first five seconds of meeting a stranger. I hope they change that dialogue in the final film because it seems very out of character for a costumed hero. Time for some Group and Comparison Pics! Here is a small collection of Spider-Gwen action figures. From Left to Right: ZD Toys, Marvel Select, Spiderverse, Marvel Legends, and Amazing Yamaguchi.